The Intermec EasyCoder 4440 has been discontinued. No direct replacement is available. Supports unlimited duty cycle printing. The EasyCoder 4440 is a 400 dpi, high capacity industrial strength printer based on the field proven 4420. The 400 dpi print resolution makes the EasyCoder 4440 ideal for applications requiring exceptional print quality, such as 2D barcodes, small text, graphic images and small linear barcodes, The new industrial metallic gray color fits into a wide variety of application settings. The EasyCoder 4440 features a ten inch per second print speed. The design allows for a full 8" diameter roll of media and 450 m (18,000") ribbon to maximize operator productivity. When equipped with the optional internal self-strip and full roll batch take-up the EasyCoder 4440 can print and rewind a full 8" diameter media roll. All units ship with product documentation. Includes Intermec LabelShop START barcode label design software. Thermal transfer, 406 dpi, 8 ips, 4.5" print width, parallel, serial & Ethernet interfaces, 8MB DRAM, 128KB flash. Includes US power cord. Order cables separately. See accessories. Thermal transfer, 406 dpi, 8 ips, 4.5" print width, EasyLAN 10i Internal Ethernet interface, 1MB DRAM, 128KB flash. Includes US power cord & Self-Strip and Full Roll Batch Take-Up. Color: Dark gray. Order cables separately. See accessories. Thermal transfer, 406 dpi, 8 ips, 4.4" print width, parallel, serial & Ethernet interfaces, 1MB DRAM, 128KB flash. Includes US power cord. Order cables separately. See accessories. 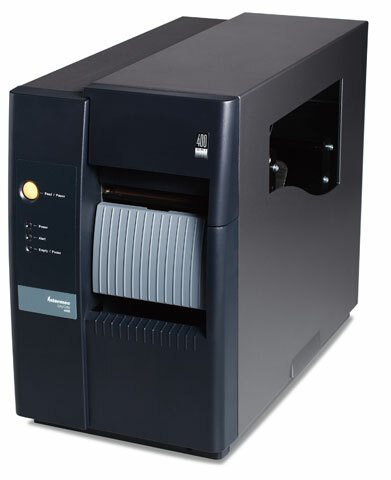 Thermal transfer, 406 dpi, 8 ips, 4.5" print width, parallel & serial interfaces, 1MB DRAM, 128KB flash and cutter. Includes US power cord. Order cables separately. See accessories. Thermal transfer, 115 VAC Power supply with US Cord, Cover over I-O Slot, 1MB DRAM, 128KB Flash, 406 dpi, Self-Strip and Full Roll Batch Take-Up. Color: Dark gray. Thermal transfer, 406 dpi, 8 ips, 4.5" print width, parallel & serial interfaces, 1MB DRAM, 128KB flash. Includes US power cord. Order cables separately. See accessories.